Ownership / Access: Joicey family. English Heritage. 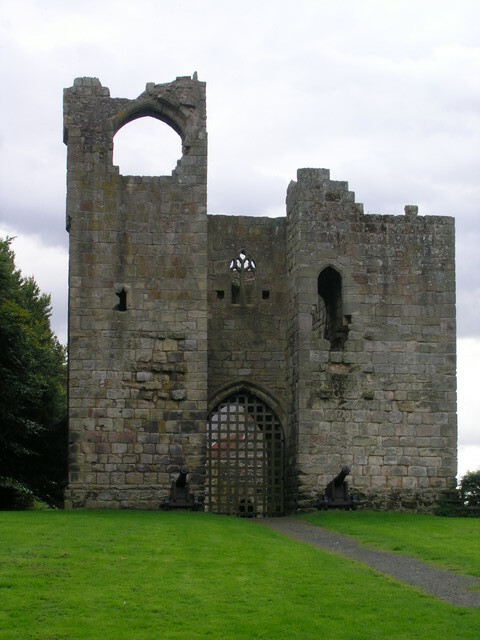 Notes: Etal Castle is a ruined medieval fortification in the village of Etal, Northumberland, England. It was built around 1341 by Robert Manners, and comprised a residential tower, a gatehouse and a corner tower, protected by a curtain wall. The castle was involved both in local feuding and the border wars between England and Scotland. There was a battle between the rival Manners and Heron families outside the walls in 1428, and in 1513 it was briefly captured by King James IV of Scotland during his invasion of England. The castle passed into the hands of the Crown in 1547 and was garrisoned as part of the border defences, but fell into disrepair and was abandoned as a military fortification after 1603. In the 18th century it ceased to be used as a domestic dwelling and became ruinous. In the 21st century the castle is owned by the Joicey family, but managed by English Heritage. Open to the public, it is protected under UK law as an ancient monument and a Grade I listed building.